The frigidity of the winter season has snuck up on us here in B.C. The frozen blanket of the white stuff glistens by the light of the moon as the barometer plunges into minus double digits. The beauty of the fresh fallen snow is almost reverent as it lends a clean, quiet tranquility to our surrroundings. As we gear up for the Season of giving and good cheer. November is a month that has alot of milestones for me. It is not only the month I was born (on the 20th and Michael, my twin was delivered). It is also the anniversary of my last cancer treatment, November 18, 24 years ago. I was a mere 17 yr old when diagnosed with stage 3b Hodgekin's Disease. Against the odds, it took 2 years, 4 treatments, and a multitude of surgeries to bring me back to the land of the living. Like clock work, though, starting the week before, I find myself down right melancholy. Still, 44 years later I find myself sad, bordering on depressed. I have alot to be happy about. Yet, I find myself closing off to people in my life. I isolate myself and am sometimes snarky towards my family. I struggle to let people 'in'. I try to be more sensitive to the signs. So I can do my best to make the necessary adjustments. These built in warnings I've learned are my body's way to let me know someone very important in my life is gone. I was once deadened to these warnings. Thanks to this site, my awareness and understanding has grown. As I get older and my journey in this life continues, my heart becomes more open to acknowledging my earliest experiences. My twin, Michael leaves an impact on me, to this day. I don't expect it will ever change. Maybe the experience will become a less painful as I continue my journey of survival. Along with my awareness on how much I have been affected by his loss. What I know for certian, is that the more I validate my brother, and his impact on my life. The easier his absence from my life becomes. I also know we need to validate ourselves as the twinless twins we are. It is the only way we can find the road to recovery. Even if we never got the chance to share that twin bond outside the womb. We are still twins inside our hearts. Live In Peace and Peace Will Live In You! I will be in New York in May 2011, on Saturday 7th to be exact. I will be holding an information session, with all the latest research results and also running a workshop. I will have copies of my new book to sign and Monica and Barbara will be there too with plenty to add from their own experience. Book your place TODAY and we will contact you with details of venue and payment. William Shatner has a programme on TV, here in Canada, called "Weird or What?". Weird name for a telly programme and I had not watched it until last night when, for some reason, I decided to give it a go. He was telling three "Weird" stories. The first was, in no way, weird to me as I have dealt with this situation in my work and, as I am not a scientist, never considered it to be weird. He was telling the story of a man who had had a heart transplant and, thereafter, developed the tastes, personality and preferences of the donor. As the heart is the seat of all of life's issues that does not seem remotely weird to me, but it did to Mr Shatner and so it was investigated. What was amazing to me was that scientists were interviewed who agreed that this could happen! They were of the opinion that cells retain memory of who we are; especially the cells of the heart and brain. Next he investigated perfect circles of ice in rivers. Again I did not find this to be weird. Surely, I thought, there must be some kind of eddy. In due course, this was proved to be the case. Having got this far through the programme I thought I might as well see what the last weird item was and I have to say I am glad I did. A couple in the USA were in need of financial assistance and applied for State aid. I do not understand the process but that does not matter, the point which does matter is that they were required to provide DNA samples to prove that they were the parents of the four children for whom they were claiming benefits. So far so good. He was found to be the father of all three but she was found to be the mother of.......none! Her DNA did not match that of any of the children. 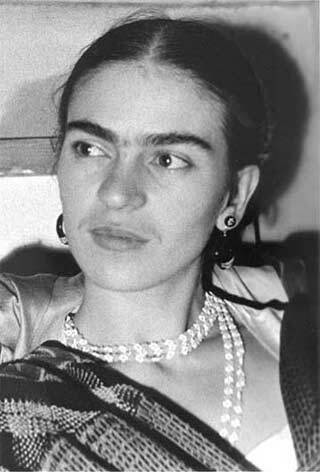 How could this be, as she was the mother; there was SO much evidence to support her claim to be the mother, yet the DNA did not support it. Well, to cut a long story short, it transpires that there is a ..........I'm not sure what it is........condition, syndrome, occurrence, thing?...........where twins are created in utero and then merge to become one human being. It is called Chimera. It occurs at a very early stage of development; when there are only two or four cells. This results in the person having two sets of DNA. If it happens later and the twins were male and female then the person born would be hermaphrodite. If the merging takes place at a later stage still then there would be conjoined twins (as I understand it, remember I am NOT a scientist!) The DNA inherited by the lady's children was from her ovaries, but it was a different DNA to that found in her hair and cheeks. When DNA samples were taken from the usual places the DNA did not match that of the children. When she gave birth to their fourth child the judge ordered that an official was present and that samples were again taken, but yet again this child was, genetically, not hers! The true situation was discovered when they took DNA samples from her cervix and found a second set of DNA. They said that there are only 40 people known to have this DNA anomaly IN THE WHOLE WORLD! Naturally, it set me thinking about womb twin survivors; could any of us have two sets of DNA? I enclose the link to Wikipaedia on the subject of Chimera, if you scroll down to "See Also" and click on Lydia Fairchild you will find the story of this lady (the version here is slightly different to the Weird or What one, but not markedly so). What an amazing story! What a frightening situation for her to be in! What an interesting thought to think that any of us could actually have, within us, our twin's DNA. Transitions that shift the physical presence of twins on earth do not mean that the connection between them is broken and the relationship is over. Its quite the contrary in my experience. The twinship lives on with a strong power that effects one's life in numerous ways. When it is owned, integrated and given a sanctuary inside one's heart, it can be a force that enhances, enriches and empowers one's life. Though a clear 'goodbye' might be something that is healing for some people, for others it is the very acceptance and connection with one's twin that brings freedom and a new ability to live. Even if one comes to a place of saying some kind of a 'goodbye', whatever that means for that individual, the 'goodbye' is often simply a means of finding a new and different way of holding the twin connection and allowing it to live on. What is important is that each surviving twin find the way that will enable them to ultimately embrace, own and celebrate their own life while integrating their twin loss. 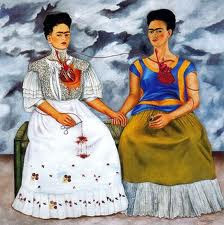 Everyone must find their own way of integrating their twin loss. Some stay actively and consciously connected with their twins; others may go unconscious and spend their life seeking to fill the void or find the one who left; while others might find other strategies that ultimately do or don't become supports for their own growth. Twinship, weather there is loss or not, is not something that one says good bye to in my experience. It is something that one holds dear, misses, yearns for, deeply embraces, remembers, celebrates, honors and ultimately accepts and moves forward with. It is in the acceptance of one's twinship and the twins transitional loss that one can establish a new connection with one's own individual path as well as one's twin(s). You sound as if you have connected to your own guidance and knowing about what path is right for you. It sounds as if your deeper wisdom, relative to your lost twins, is showing you how to walk forward in a way that will support you to stay connected and also live a joyous, free and integrated life; and that is what we all want and need. This is a testimony of what it might be like to be a bunch of guys. Enjoy! This is Claudia's presentation, given at the Womb Twin conference. Dr Denise Moffat has some interesting observations about womb twin survivors. The Vanishing Twin Syndrome is personified by certain personality characteristics, gestational features and spiritual lessons. There is a higher incidence of this syndrome in healers. The theory is that if they could not save their own twin, their destiny is to dedicate themselves to saving others in the world. Do you have a vanishing twin? Control Issues: The surviving twin often has control issues and it may be based on the premise that since they couldn’t control what happened in utero, they are doing everything in their power to do so now. Survivor’s guilt: There is a lot of survivor’s guilt for taking the nutrition from the vanishing twin, not being able to help prevent the death of the twin and viewing this resorption process in utero. Once identifying this occurrence, the patient must go through the grieving process like in any death of someone that means a great deal to them. 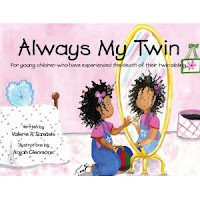 They experience loss, guilt, grief and anger at being separated from the twin. Sometimes the survivor does not care if they live or die and may occasionally have thoughts of suicide. No competition: Survivors don’t usually like competitive sports unless they are competing against themselves. They subconsciously feel that if they compete with others, death may result. They want everyone to get along and work together. Sabotaging relationships: Sabotaging happens when relationships start going too well. The superconscious/subconscious thinking is that if they get close to someone that they will be in danger and might die from the actions of the surviving twin. Because they love this person so much, they will push them away to protect them. They also seem to self-sabotage to make sure they have paid for what their role was that caused their twin to depart in utero. Not deserving: The survivor often feels they don’t deserve all the good this world has to offer so they find ways to exclude themselves from receiving good. They are major givers, but not very accepting takers. Money issues: These are motivated people. Because they do such good in the world, often money follows. The problem is that Vanishing Twins don’t seem to be able to hold onto the money because they self-sabotage. Survivor’s guilt prevents them from using the money for their own care. They give it away or let it flow through their hands, not keeping any of it for themselves. Fascination with or friends with twins: Twins have a special energetic bonding with each other which lasts their entire lives. Just because your twin left you in utero, doesn’t break that energetic bond. And if you don’t feel your twin still around you, naturally you will be attracted to twin energy. Feeling abandoned, left out, and excluded: These are the kids who get picked last for the team, who don’t make friends easily and feel like other’s can’t relate to what they are going through. They are searching for close relationships but can’t seem to find them. Often they would rather spend time with older people than kids their own age. Low self-esteem, lack of self-love: This is one of the major Spiritual lessons that the survivor must work through before they can fully be the gift to the world that God intends. Low self esteem is intertwined with Unconditional Love of Self, Trust and Discernment, and Worthiness lessons. See handout on Spiritual Lessons for more on this. Vanishing Twins are often in the Healing Field: Since they could not heal the situation in utero, they are intent on healing the world and saving others. There are lots of surviving twins who are massage therapists, doctors and nurses. Other Weird Stuff: I actually had one woman I was working on take out a picture from her wallet to show me who her vanishing twin was. She explained that she believed in reincarnation and that she somehow felt attached to this man. When I asked her if she had ever met the man she said she hadn’t, but that she felt compelled to cut his picture out and carry it around with her. At the time she had had the picture in her wallet for over two years. Trauma to the mother: Three to four months in utero is about the time the twin “checks out” and is being reabsorbed by the body. What are some causes? Some include getting hit in the stomach, car accidents, falling down a flight of stairs, emotional trauma, experiencing high fever from an illness, violent vomiting, etc. Did your mother smoke? Studies show that smoking lowers the oxygen content of the blood so less oxygen is available to the fetus. Smoking is also associated with low birth weights. So does that mean there is less available nutrition for two fetuses? History of twins in the bloodlines: Are there twins in the family? If so, there is a greater chance of repeating that within the same family lines. Long labor: Here’s how this works–when you have one baby ready to come out, the placenta (the sac that contains the fetus) and the pituitary gland produce a certain amount of a hormone called oxytocin (also called pitocin). The function of oxytocin is to cause muscular contractions to push the baby out. So, if there are two babies, then there is a proportionately larger amount of oxytocin. But, if one of the fetuses dies, there is not enough oxytocin to push out the extra residual placenta associated with the dead fetus, and the birthing process takes much longer. These days, a cesarean section is performed when the shutdown occurs to take the stress off the fetus. No ultrasound background: If you were born before the 60’s, most likely your mom did not have an ultrasound so twins could easily be missed. An x-ray was only rarely taken because we didn’t want to expose the baby to radiation unnecessarily. Giving birth in a hospital before the 70’s: There used to be a time when doctors only gave their patient the information they thought they needed to know at the time. If the mother had a difficult birth or there was extra placenta or a resorbed fetal membranes, the doctor gave these to the nurse who disposed of them and did not tell the mother about it. I think midwives were a little more open to this miracle and included mothers in the information they gathered about their birthing and findings. Many midwives I’ve talked with have these placentas in their freezers and use them to educate other midwives about the process. Also, some midwives would save these extra placental tissues for the mother for a special burial ceremony later. Many eggs released, few fertilized: A woman’s ovaries produce hundreds of thousands of eggs from the ovarian tissue over her reproductive lifetime. Only a few of these are released each month. It takes the influence of several million sperm surrounding the egg for one to finally penetrate the egg and fertilize it. It seems as we get older, that twins are more common. Maybe it’s our body’s last ditch effort to procreate. Imperfections or improper nutrients reaching both feti: It would make sense that not every egg is perfect and not every sperm is perfect. When the imperfection is too great, problems can occur in regards to the available nutrition for one or both of the babies. When this happens, the fetus starves and is then resorbed back into the body. The remaining fetus then has enough nutrition to grow to full-term. Do you have any dermoid cysts? This is a little tumor made of every conceivable type of cell from skin cells, hair cells, tooth cells and more. Evidence of a resorbed fetus or a vanishing twin? I think so. These are the typical issues that the surviving twin must work through to live a full, happy, and productive life. Although many other people without twins also have to work through these issues, I see these lessons every time with those who have a vanishing twin. I am important and a gift to our world. I deserve all the good this world has to offer. I forgive God/Jesus/My Higher Power. 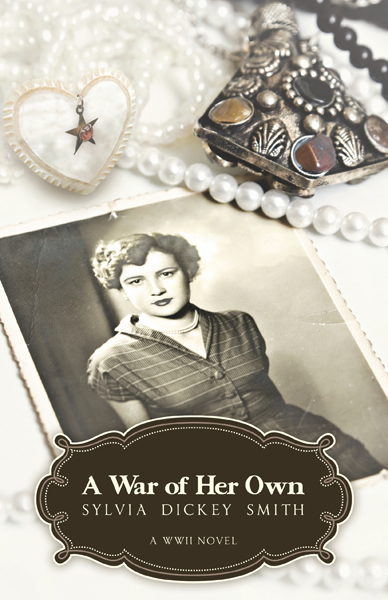 If you relate to some of this information, you may have a vanishing twin. I would recommend the article: Life in the Womb: Dangers and Opportunities by David B Chamberlain, Ph.D. This article comes with reprint rights providing no changes are made and the resource box below accompanies it. Dr. Denice Moffat is a practicing naturopath, medical intuitive, and veterinarian working on the family unit (which includes humans and animals) through her phone consultation practice established in 1993. She has a content-rich website at http://www.NaturalHealthTechniques.com and free monthly newsletter. She has a vanishing twin sister. The conference! What a result! Well, we managed it, after a real struggle to get enough people. In the end we went forward with a group of 11, and we had to adapt things to their needs, but the open space format helped, because we were able to negotiate two presentations and two workshops, which seemed to satisfy everyone. The group was a bit too small to split, everyone thought, so we did everything as a single group. The rain fell relentlesly and occasionally there was a glimpse of sun, we mixed and mingled talked and drank a great deal of tea and coffee in the corridor outside, and browsed the literature table and shop. The presentations were, first, about a study of womb twin survivors carried out in Hungary - yes, Viktoria Sas came all the way from Hungary to be there! 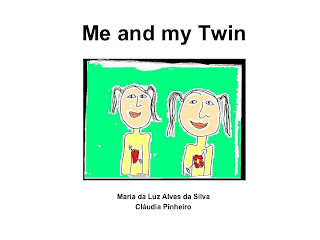 - that compared a group of 14 people ( out of a total of 114) who had found their womb twin in a family constellation group with the others who had not, using a questionnaire similar to mine but with some different statements. The same proportion appeared: 1 in 8 of the group were womb twu survivors. Also the commonest effect was "searching for something but not knowing what it is". Also a need to control and perfectionism were found also to be significant effects. Then secondly Alfred Ramoda Austermann from Berlin explained some of the healing techniques he had developed to help people with trauma and in particular the trauma of losing a twin before birth. His particular skill is family constellation. After a substantial lunch in the dining hall with many other people who had come to the centre for meetings that day ( there were about 8 other groups doing other things, a busy day for the centre!) It was time to tackle the thorny issue of sexuality, then another tea break. and we were exploring the general topic of twinship. On Sunday we made a ritual enactment of the healing path, using all kind of props, such white black and silver cloth,pink ballons, stones, scarves, boxes and even horse chestnuts! As each person walked their healing path , we all watched in wonder as the props became a Black hole, the essence of Spirit, Alpha energy, trouble, memories and different gender energy. Beautiful! Finally after the Annual genetral meeting of wombtwin.com, we sat round and planned the next event. Ill describe that on the wombtwin.com blog. In all, the wonderful, special energy in the group that is typical of womb twin survivors, I have discovered, and three new volunteers to help with the organisation. A good result. I am glad we didn't cancel! 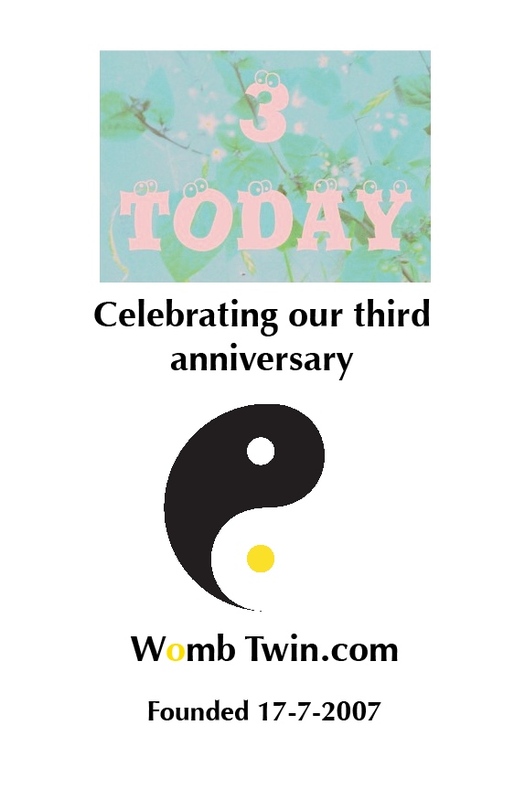 Womb Twin Survivors Conference: all welcome! I am told that the advance publicity doesn't make it clear that absolutely anyone, womb twin survivor or not, is welcome at our conference. This will be the third international OPEN SPACE conference to be held on this subject. It will be a rare opportunity for everyone to learn more about a common occurrence in pregnancy that has been largely ignored - until very recently. 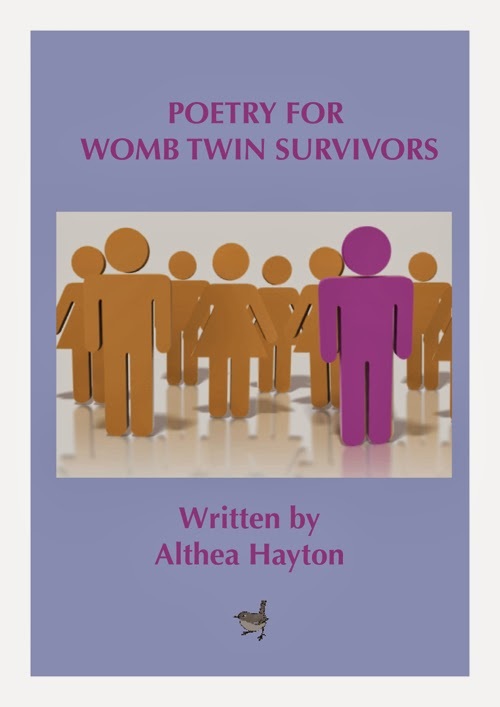 It will be a chance for womb twin survivors, plus the people who live with them, work with them, try to help them or just want to learn more about them, can get together and discuss these issues. Only 40 places are available, so early booking is recommended. Last week a poster advertising a lecture on Bi-polar caught my eye. This was a chance to meet someone who was regularly treating womb twin survivors & was not aware of it. This someone was pshychiatrist Dr. Patrick McKeown of St. Patrick's Hospital, Dublin. Dr McKeown is also a director of Aware, an Irish Mental Health Charity. When I arrived at the Swift Hall I met another of Aware's Director who told me that it would not be possible to see the Doc because he was so busy. I gave her a copy of "Untwinned" with my contact details & implored her to get him to read it explaining that one in ten of the audience couple probably be treated without medication. It was strange sitting with 150 people who probably depend on Lithium, Epilim or some other chemical concoction to keep them "balanced" when there was knowledge available that could set many of them free. The lecture covered symptoms, treatments regimes, types of "BP" (bi-polar) & something called "co-morbidity" - essential two simultaneously occcuring symptoms. eg. Suicidal tendencies & manic behaviour. Dr McKeown said "Where these co-morbid conditions get in we don't really know ...." Well, we've a good idea, haven't we? Anyway, I did succeed in meeting Dr. K who was aware of the impact of losing a born twin, but not the womb twin survivor phenomenom. He is going to read the book so let's hope that results in more people being put our way & fewer to the pharmacy! Sometimes life is such a funny thing. Not funny Ha ,ha, but funny, insert the theme song to the Twilight Zone, T.V. Programme. That old familiar high pitched 'nee ne, nee ne, nee ne, nee ne' my favorite television program of my childhood. Memories of a simpler time when the world was not yet plugged into cell phones, iPods, PC's, DVD's, CD's& MP3's. Over scheduled, over stimulated, and over loaded. When communicating actually meant having a conversation with out using abbreviations. AND with an actual person, either in person (wow, what a concept!) or at least on the other end of a telephone line. A time when kids actually respected their Elders, granted, maybe out of fear than out of respect. But respected none the less. Where the English language was actually a thoughtful and thought out experience. Not littered with slang and curse words. When going down to the corner store with 2 bits could buy you more junk food loaded with penny candies, than you could actually eat in one sitting. I miss those almost forgotten by-gone days of my childhood. During the course of the conversation she brought me up to speed on the goings on in her busy life. She shared with me her recent ups and downs and challenges. She shared with me funny stories that can only come from raising 4 boys, which made me laugh till I cried. One story in particular amazed me. My niece told me that for the past month or so, her son has been playing with an 'imaginary friend'. I told her that this is totally normal and that she had a friend when she was little too. (so did her brothers) My niece told me how one day she was in the kitchen when she over heard my nephew. He was splitting a gut, belly laughing his head off. Curiosity got the better of her so she had to go investigate. He was all alone in him room entertaining himself , playing cars. She asked him why was he laughing,? He said he was just playing with his friend. Later that day she asked her ex if he had noticed the boy playing with an imaginary friend. Well, not only had the boy been playing with his friend, but that they in fact play all the time and have great fun. My nieces' ex also revealed that the boy talks to him all the time about his imaginary friend. But refuses to talk to her about him! My nephew revealed to his Dad that his friends' name is MICHAEL. My niece asked me if I knew anyone named Michael close to the family who had passed away. Shocked, I told her that my twins name was Michael! That her little son , who could never have known his Great Uncle THIS side of life, has unknowingly been playing with him for the past month or so! I was absolutely convinced, while my niece was struck silent. I was certain that my nephew was being entertained by my dear long dead twin brother. When we go and leave this world we don't really leave. July 17th was the third birthday of WombTwin.com Ltd, the non-profit organisation with members which has initiated special support for womb twin survivors around the world. A document telling the whole extraordinary story of the development of WombTwin.com can be downloaded here. In my life as a single person, with no concept of my wombtwin(s), I always wondered why I had SO MANY interests, skills, and a desire to NOT settle on one thing, because it would deprive me of doing all the other things that interested me. Focusing on one thing was very disappointing. As a child and passionate musician from the very beginning, I wanted to play ALL the instruments in the orchestra. I settled on being a pretty good violinist, but also studied the piano and flute, with accompanying sadness that I couldn’t master them too. As a college student, I did not want to choose a major, because that meant I would have to give up studying other things in depth. Being interested, and very good at, math, and also interested in French and music, I ended up as a psychology major. Although I am a pretty good speaker of the French language, I studied one year of German and Spanish, and feel sorry that I can’t speak them with more proficiency, not to mention ALL the languages in the western world. It turns out that, as I discovered that I am a wombtwin with a brother I lost, and maybe someone else too, I learned that I have a severe problem with simple numbers. I know that “a couple” means two. Those “twos” who have tortured me by pointing out my singleness, those wedding rings that have reminded me that I am only one, and any sentences containing the word “we” or “my husband/wife/partner and I” led me into the blackest hole that was maybe responsible for discovering I am a wombtwin. The exact number “2” or any implication that someone was part of a twosome, caused me to bury myself in my house and my bed, because you can’t go into the world without encountering the above. Back to the subject: My brilliant and compassionate guide in the wombtwin journey and I discovered that I have mistaken the phrase “a couple of…” to be some undefined number, what others call “a few of,” a number of maybe 2, 3, or 4, but definitely not exactly 2. So is my “couple” my wombtwin and and I as one, my mother as the second? My 2 twins (triplets) as one and me as 2? 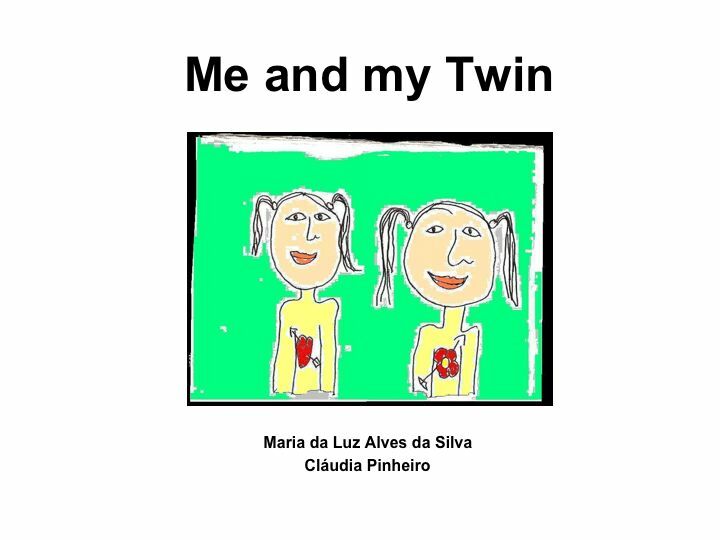 My wombtwin and I as “one or so” and some other combination of people, such as my parents as another “one or so?” Exactly what does “a couple of” mean? I have also learned that I do unusual and messy things when it comes to basic counting. I just bought 3 expensive tickets for my daughter and myself to a top notch award winning musical, thinking I’ll find someone for the third space (My wombtwin? My womb triplets sharing a seat because they’re so small?) I have one extra place at my kitchen table than I need, even with the expected guests that may come by, because you never know if an extra person may surprise me. While I have complained about the trauma of being in some kind of triangle all my life, which I had to manage because 3 is hard (ie. making sure my mother didn’t get jealous of my father’s relationship with me) I find myself in threes more than probability could possibly create (ie. my husband, me, and his mistress!). Listing them all would take up too much space. In this wonderful and painful path of discovery, I find myself saying “I have done/do enough things for 3 people.” Which is true, and is causing me to explore the possibility of a third one. I am finally starting, actually forcing myself, to narrow down to 2 or 3 things, which is a great improvement from infinity. I am finding some rewards from aiming to do just “a couple of” things well. I am also trying to discover just exactly how many people I am.